Liberty Square - The Mickey Wiki: Your Walt Disney World Encyclopedia! Liberty Square is land inside the Magic Kingdom. The concept of Liberty Square began as an expansion idea for Disneyland known as Liberty Street. Spearheaded by Walt Disney, Liberty Street was to be a road that ran parallel to Main Street USA . The new area was to be set during the era of the Revolutionary War and it would have featured colonial architecture and a cobblestone road. In fact, some designs for the street featured 13 buildings, one representing each of the original colonies . After walking down Liberty Street, guests would arrive at Liberty Square. In the square, guests would be able to see a blacksmith shop, a glassmaker, a weaver, a print shop, Paul Revere’s silversmith shop and a cabinetmaker . The real draw of Disneyland's Liberty Square however, was to be Liberty Hall (also called Independence Hall in some concept art). This colonial meeting hall was to house two major attractions. The first was to be found in The Hall of The Declaration of Independence. Here, guests would see the dramatic story of America’s struggle for independence come to life. The second attraction was to be found in The Hall of American Presidents. This attraction was to be titled One Nation Under God and it would have been a presentation of “the mighty cavalcade of American History" . Also found in Liberty Square would be a recreation of the Liberty Bell and the Liberty Tree, complete with the 13 lanterns . Although initially advertised as opening in 1959, Liberty Street would never reach fruition, as much of the company’s resources ended up being used to update Tomorrowland . Although never used in Disneyland, Liberty Street returned to the limelight when Imagineers began working on designs for the Magic Kingdom. Due to the close proximity of New Orleans to Florida, Imagineers did not think that guests would be all that interested in a version of Disneyland’s New Orleans Square. Instead, Imagineers turned to the old Liberty Square expansion idea as a solution to their problem. As opposed to a version of New Orleans Square, Imagineers decided to create an entire land set in the Revolutionary War era. Liberty Square would take its inspiration from east coast colonial architecture. Besides getting its theming from the old Liberty Street idea, Liberty Square also featured the Liberty Tree, the Liberty Bell and a brand new attraction based on the One Nation Under God concept- The Hall of Presidents . The Hall of Presidents in Liberty Square. Photo by tcwmatt. Liberty Square opened with the rest of the Magic Kingdom in 1971. Besides the aforementioned Hall of Presidents, Liberty Square also opened with the Haunted Mansion, the Admiral Joe Fowler Riverboat (which actually opened one day later than the rest of the land) and the Mike Fink Keel Boats . Unlike the many of the lands in the Magic Kingdom, Liberty Square has only had a few major changes since opening day. The first of these was the addition of the Richard F Irvine Riverboat in 1973 . Unfortunately, the Joe Fowler was damaged in 1980 and never returned to active duty . In 1996, the Richard F. Irvine Riverboat was renamed the Liberty Belle . The next change in Liberty Square came with the closure of the Mike Fink Keel Boats. The Mike Fink Keel Boats were free floating boats based on the popular Disney television show Davy Crockett. 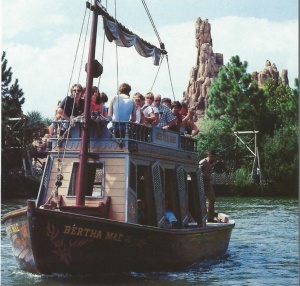 The Keel Boats allowed guests to take off from Liberty Square and circle around Tom Sawyer Island. In 1997, one of the Disneyland Mike Fink Keel Boats capsized with guests on board. After the accident, both the Disneyland and the Walt Disney World versions of the attraction were permanently closed . The only other changes to occur in Liberty Square have happened in The Hall of Presidents. In 1993 President Bill Clinton was added to the attraction and the show received a new narration which focused more on slavery and other issues of race relations then it had in the past . The attraction was once again changed in 2009 with the election of Barack Obama. At this time the attraction was once more given a new narration. Another addition during the refurbishment was the inclusion of Abraham Lincoln delivering the Gettysburg Address and a montage of Presidential speeches . On October 2, 2016, The Muppets Present… Great Moments in American History opened in Liberty Square . The new interactive show takes place primarily above the Heritage House at various times throughout the day. The Muppets Present... Great Moments in American History, actually consists of two different shows which are performed at different times. One show features the Muppets telling guests the story of the signing of the Declaration of Independence, while the second show involves the midnight ride of Paul Revere . The Haunted Mansion- This dark ride allows guests to board Doom Buggies and tour a spooky mansion. Along the way guests will meet 999 friendly ghosts, but there is always room for one more. 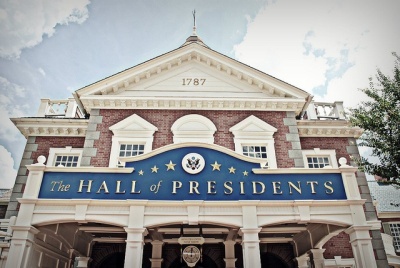 The Hall of Presidents- This show allows guests to see America grow through the eyes of its 44 Presidents. In the finale of the show all 44 presidents will appear on stage together. 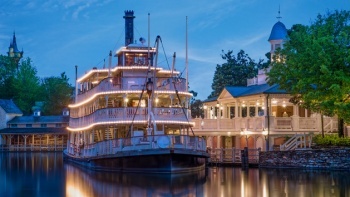 Liberty Square Riverboat- A real authentic steam boat named the Liberty Belle allows guests to sail the Rivers of America with Samuel Clemens and Captain Bixby. The Muppets Present… Great Moments in American History- Performed throughout the day above the Heritage House, The Muppets Present...Great Moments in American History features the Muppets telling guests the story of either the signing of The Declaration of Independence or the midnight ride of Paul Revere. The Mike Fink Feel Riverboats- These free floating boats allowed guests to travel the Rivers of America and go around Tom Sawyers Island before returning to Liberty Square. Sleepy Hollow Refreshments-Located at the entrance to Liberty Square, Sleepy Hollow Refreshments serves funnel cakes, waffles and ice cream. Liberty Tree Tavern-Located next to the Diamond Horseshoe, the Liberty Tree Tavern is a table service restaurant specializing in American cuisine. Columbia Harbour House- Located across from the Haunted Mansion, the Columbia Harbour House is a quick service restaurant that sells fish, shrimp, chicken and sandwiches. Liberty Square Market- Located by The Hall of Presidents, the Liberty Square Market is a stand that sells fruit and refreshments. Heritage House- Located near The Hall of Presidents, the Heritage House sells America memorabilia and souvenirs. Ye Old Christmas Shoppe- Located near the entrance to Liberty Square near Fantasyland, Ye Old Christmas Shoppe sells Christmas merchandise year round! Memento Mori- Located near the Haunted Mansion, this store sells Haunted Mansion themed merchandise. Yankee Trader Gourmet Shop- Located near the Haunted Mansion, this store sold (sometimes unusual) cooking and serving accessories. The Yankee Trader Gourmet Shop closed on July 27, 2014. In the 1970's a daily ceremony was held in Liberty Square called "The Sons and Daughters of Liberty". The ceremony involved a fife and drum corps marching with a Cast Member in Revolutionary-era costuming . The replica of the Liberty Bell found in Liberty Square was cast for the same mold as the real Liberty Bell. The cast was created for Walt Disney World in Annecy-le Vieux, France by the Paccard Fonderie. If guests look closely at the guard house on the Liberty Square Bridge, they can see a register featuring the names of other travelers who have entered the square . Ye Old Christmas Shoppe in Liberty Square is designed to look like three separate shops with the walls opened between them. They are supposed to be owned by three different colonial families- a German family, a woodcarver's family, and a musician's family . The live oak that serves as the centerpiece of Liberty Square is more than 130 years old, and was found on the southern end of the Walt Disney World property. In order to move the 38-ton tree, 2-inch holes were drilled through the trunk, then fitted with steel dowel pins. Once transplanted, the pins were removed and replaced with sections of Oak Hardwood. With careful observation, the plugs can still be seen today . The rocks that guests see after crossing the bridge to enter Liberty Square were quarried from a location 6 miles from where George Washington crossed the Delaware River . This page was last modified on 2 January 2019, at 17:32. This page has been accessed 111,921 times.